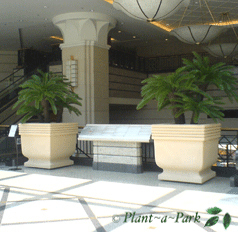 Planter pots in the newest shopping mall in the new Business District of Beijing (Financial Street), called for a sophisticated design, in a finish and colour to match the sandstone floor. 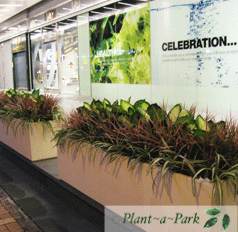 We designed and manufactured planter pots of 1.5M wide by 700mm high to hold colourful plant arrangements also provided by Plant~a~Park. Their restaurant is designed with an east/west mix with many reflexive surfaces. We designed and manufactured a three-tiered pot with an antique fronze finish, 1M wide x 900mm high. 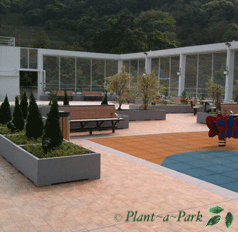 The roof garden on each tower called for low, sturdy planters for living plants. 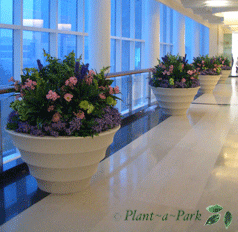 The design of the planter was a collaboration effort between our company and the landscape architect, ACLA. Grey stone finish. An outdoor planter right around the building called for living plants, and the design was a collaborative effort between our company and the landscape architect, Urbis. Sandstone finish. 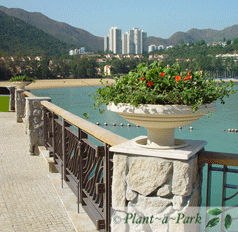 The classical design of plinths and railings demanded a classical approach to the planter urn. Finish sandstone. 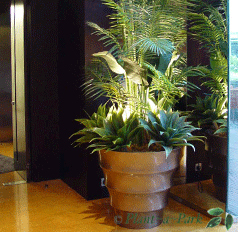 Classical columns and marble floors on a large podium demanded large planters to hold heavy-headed Cycas Palms. Sandstone finish. This funky, trendy hotel called for planters in a very different design. 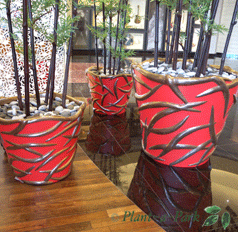 Here, the motif of fish hanging behind the Reception Desk was employed on the planter, in red and metallic finishes.